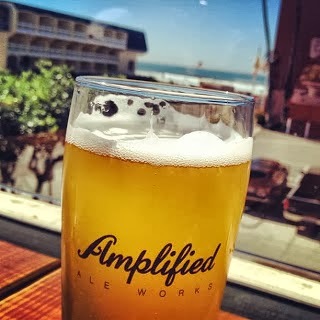 Amplified Ale Works will be celebrating Oktoberfest on their ocean view patio at Cali Kebab & Beer Garden in Pacific Beach this Saturday, September 28, offering ten different German beers on draft and beer basted brats from The Heart & Trotter Butchery. German beers to be showcased by Amplified Ale Works include multiple Oktoberfests from Hofbrauhaus and Weihenstephaner, as well as dunkel, doppelbock, weizenbock, kellerbier, schwartzbier, and rauchbier from other German breweries like Aecht Schlenkerla, Kostritzer, Hacker Pschorr, Schneider, Sunner, Spaten, and Paulaner. On the grill you will find beer basted bratwurst from Heart & Trotter served with spicy mustard, sauerkraut, and served on a house made pretzel bun, as well as pork skewers, and Cali Kebabs regular menu offerings. California Kebab & Beer Garden is casual restaurant which houses its craft brewery, Amplified Ale Works. The mission of the establishment is to serve its patrons food and beer with Amplified flavor and quality. California Kebab & Beer Garden is open 7 days a week from 11am to 11 pm Sunday through Wednesday, and until midnight Thursday through Saturday. More information can be found at Cali-kebab.com and on their Facebook page.